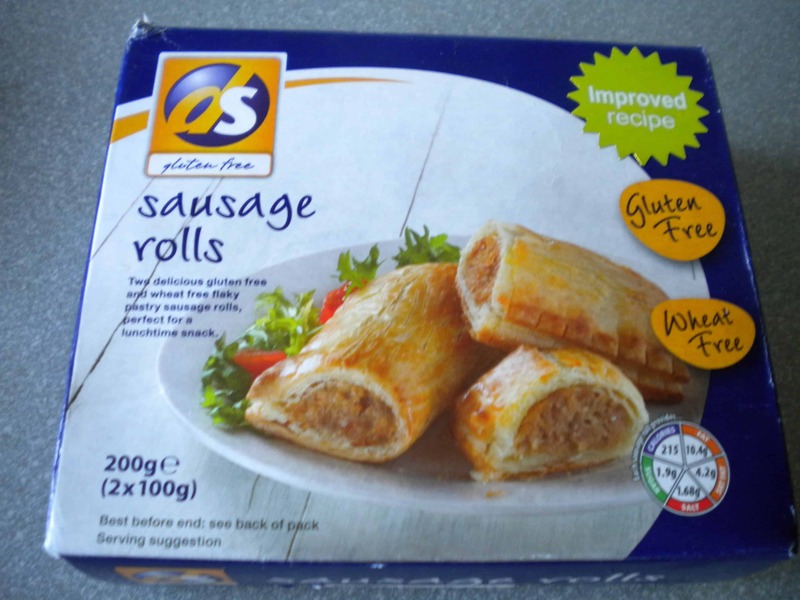 When I got an exciting parcel full of Dietary Specials improved range they are relaunching, I jumped straight at the sausage rolls! Working in a pasty shop, I often spend a moment drooling over the crispy looking sausage rolls, and this was my chance to sample some gluten free sausage rolls myself! Coming in a pack of 2, these sausage rolls are a stage between mini cocktail sausage rolls, and the jumbo variety we stock at work. They take 25-28 (very specific!) minutes to cook in the oven from frozen, and it was a long wait as I smelt them cooking! After 25 minutes, I accidentally burnt the edges of mine, (think I put them a bit too high in the oven in my impatience!) but a dollop of (gluten free) BBQ sauce, all was not lost! Crisp and brown, these sausage rolls certainly looked delicious! The pastry was light and flaky – I haven’t had gluten free pastry that was this flaky before and it reminded me a little of how sausage rolls used to be! 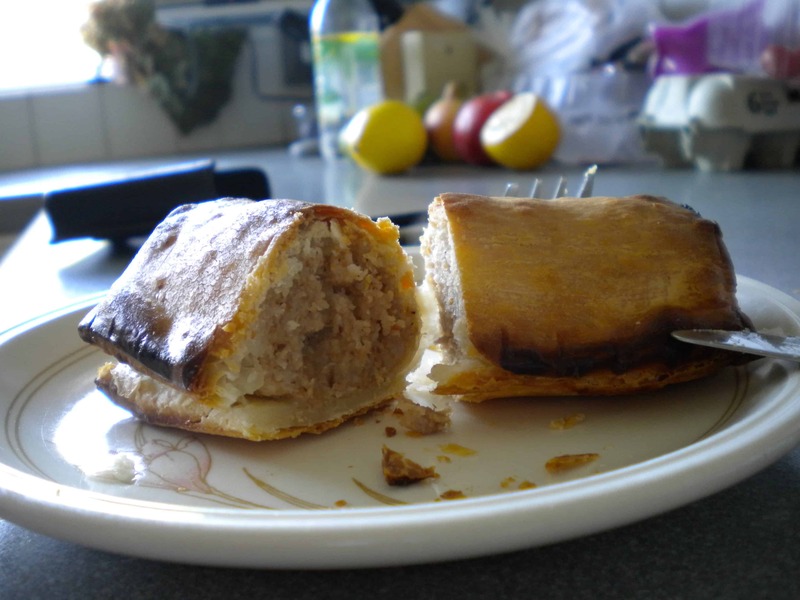 The sausage meat filling was tasty and of generous proportions, leaving me feeling heartily warm and satisfied as the roaring gales and rainfall washed away the last remains of summer outside! Meaty, flaky and with the familiar, feel-good taste of comfort, these sausage rolls would make an ideal snack – probably a little too small for lunch, although maybe I am just greedy! For more informati0n and to find out where to buy these and the other frozen DS products, click here. Glad that you liked the Sausage Rolls Sarah, it’s only 9 am in the DS offices and our mouths are watering with your review! BBQ sauce and sausage rolls… a great combination. I have had these a couple of times and they are very nice, but expensive! I too like these, but they are so expensive (£2 for 2 sausage rolls) that I can only afford to buy them once every few months. – foods are too expensive that every day essentials have to be looked on as luxuries, so that you feel you have to ration yourself! Rich, I definitelty agree with you – gluten free foods are xtremely expensive and I hope this will change in the future. I hope that with a growing increase in coeliac disease sufferers and a greater knowledge of “gluten free” that prices will eventually come down in price. I can only hope that with this increase that we can see more free from products filtering into the mainstream. I find it a definitely improvement that 10 years ago I struggled to find a loaf of GF bread, but now I have so many options and I see “gluten free” everywhere. I guess it is about spreading the word and trying to spread awareness. as much as possible.